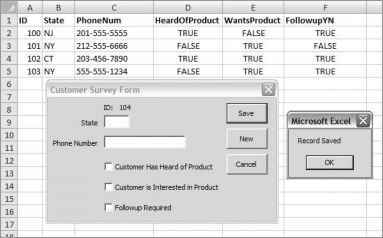 We just created a class to handle our data and modified our Excel Utility class to help the cCustSurvey class. Let's put cCustSurvey to work by coding it into our UserForm. Open the Customer Survey form (UserForm1). 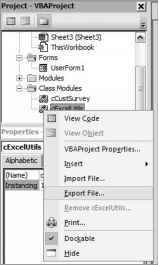 Open the code view by clicking the View Code button on the Project Explorer toolbar, as shown in Figure 4-7. Figure 4-7. The View Code button displays the code window for UserForm1 (selected). The m_oCustSurvey variable will do most of the work for us, and the m_blnSaved variable will store the return value from the m_oCustSurvey object's Save method. When the form is initialized, we're instantiating our cCustSurvey object. 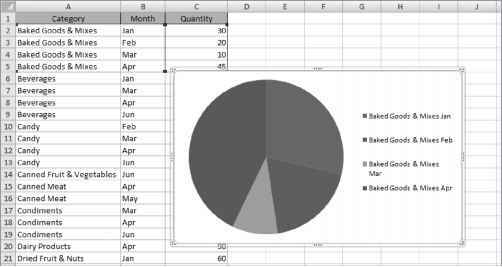 Then we're setting the DBWorksheet property. This is a very important step. This value must be stored right away so the class can determine the next valid ID and so it knows where to store the data it collects. Then we get the next available ID number and display it in a label. We then initialize our save success flag to False, and call a function to clear the form. The ClearForm procedure does nothing more than blank out the text input fields and set the check boxes values to False (or not checked). 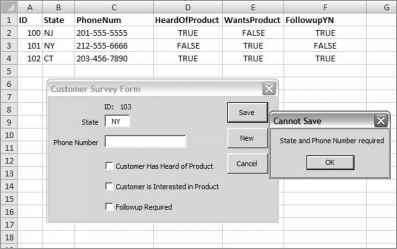 Our form has three command buttons: one to save the data entered (Save), one to clear the form and add a new record (New), and one to cancel the data entry operation and close the form without saving the data (Cancel). The first section of the code is sending the values to the class. 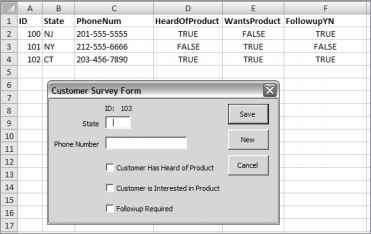 In the real world, our class would perform some input validations (such as validating that we entered a phone number using the correct format). The second section of the code is calling the m_oCustSurvey.ValidateData method and displaying a message if both text fields do not contain data. If the data is present, the m_oCustSurvey.Save method is called. Finally, we're calling a function called DoAfterSave to perform our cleanup. We're passing in our success flag so that this method will be the one calling out any messages to the user. Our cleanup code clears the form, gets the next available ID number from the database, and sends the user a success (or failure) message. Once again, we use the Len function to help us make this determination. If the length of both strings summed together is greater than 0, then at least one of the fields contains data. If the result is True, then we prompt the user as to whether they want to continue with the new record and throw out the existing data. The last step is to create a procedure in a standard module to launch our Customer Survey form. In the VBE, add a new standard code module and create a new subroutine named ShowForm. Add the following line of code to the procedure. If you renamed your UserForm object, use that name in place of UserForm1. Let's run our form and enter some data. 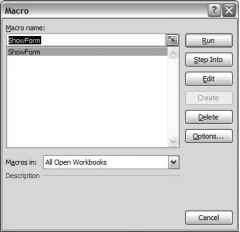 In Excel, run the ShowForm macro, as shown in Figure 4-8. The Customer Survey form displays. The ID displayed is 103, and as you can see in Figure 4-9, the last entry in the table is 102. Also note that row 5 is the next row available for data. Let's check our code. Enter NY in the State text box, but leave the phone number field blank, and then click the Save button. Figure 4-10 shows that our cCustSurvey's ValidateData method finds that neither piece of required data is present, and returns a message to our client code in the UserForm. Click OK and enter a phone number, and then check one or more of the check boxes. Click Save. The success message, shown in Figure 4-11, is displayed to the user, and row 5 now contains the data we entered on our UserForm. Notice that the ID label has been updated to show the ID for the next record. Let's test the New button before we move on to a more advanced UserForm. Clicking the New button with a blank or empty screen does nothing. If check boxes are checked but the text fields are empty, it will clear the screen without a prompt (this is because only the text fields are required). 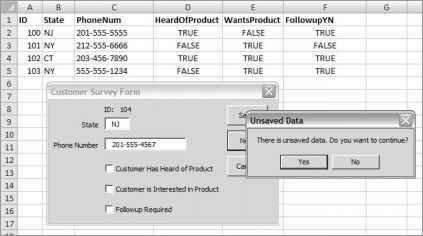 Enter a state and/or phone number and click the New button, and you'll receive a warning that the data has not been saved (as shown in Figure 4-12). Clicking No returns the user to the form without making any changes. Clicking Yes will clear the form for new entry. We made a useful addition to our cExcelUtils class. Let's export that file (overwriting the existing copy) so we can use that new functionality in other projects. 1. In the VBE Project Explorer, right-click any item in the project tree. 2. Choose Export File, as shown in Figure 4-13. 3. Navigate to wherever you store your *.cls files, and save cExcelUtils.cls.